ASTARTA’s farm units have successfully finished the sowing of spring crops. 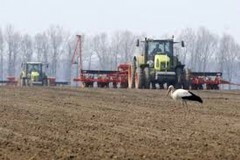 The total crop area sown in spring is about 170 thousand hectares, including 41 thousand hectares of sugar beet, 41 thousand hectares of sunflower, 67 thousand hectares of corn, 20 thousand hectares of soybean, and the rest under other crops (barley, oats, buckwheat, etc.). The structure of crop rotation reflects the existing market trends. Thus the reduction of sugar beet plantings will allow the company to organize harvesting and processing of beets in the optimal terms, focusing on the cost-efficiency and quality of sugar. In addition to own beet production ASTARTA will traditionally cooperate with farmers who supply its factories with sugar beets. The increase in areas under corn could also bring a good financial result against the backdrop of the continuing trend of price recovery for this crop. This spring sowing campaign was conducted in a record short terms. All technological operations were carried out in the optimal time, which along with appropriate level of soil moisture gave a quick start to plants growing. The Company is progressing in improving the efficiency of field works: we are concentrating each culture sowing on the large plots, using GPS tracking not only for tractors, but for all trailed aggregates, ect. As of the end of May, winter and spring crops are mostly in good and excellent condition. The weather in the Eastern and Western production units contributes to their development. Currently ASTARTA’s specialists are monitoring plants’ development and carrying out crop treatment. This year, ASTARTA’s agronomists planted more than a thousand test plots of soybean, sunflower, sugar beet and other crops. The best sorts will be selected for the next year cowing campaign.